Ok so, I was a wuss the first time but with modern medicine I sucked it up on round two. Had to have an MRI on my back. This is about the fifth over the years and my experiences have gotten progressively worse. I don’t fit in the machines and they have made me chlosterphobic. I went last week and even using the larger hole machines I still couldn’t do it. So, back this week we went. Two Valium later with Jason Borland streaming and I was in the tube. Made it through ok so the wife said we should go for dinner. 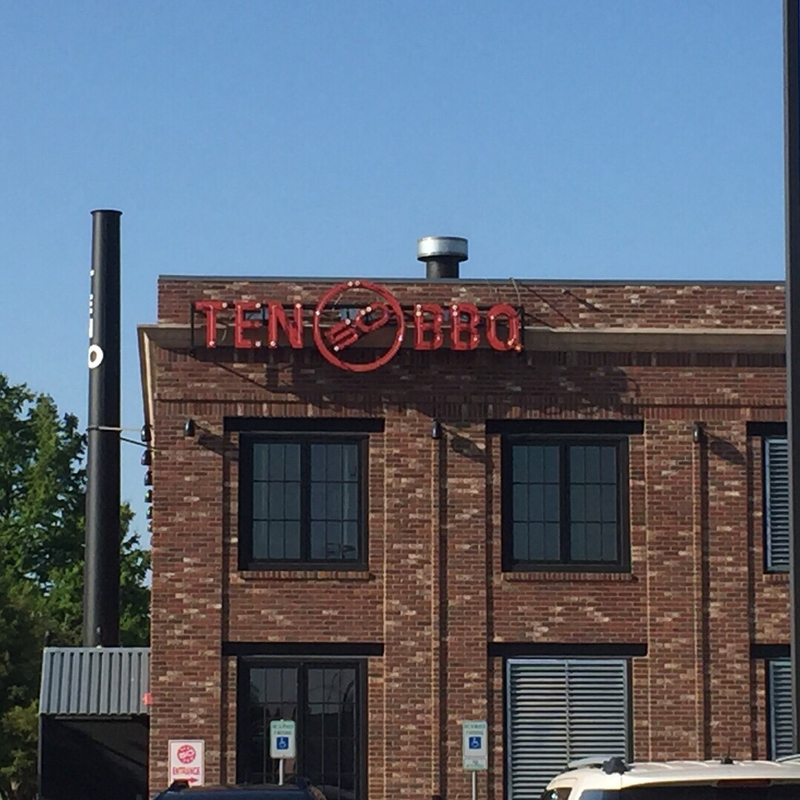 I spotted Ten 50 BBQ down the street and decided to give it a shot. Anyway, had brisket, pork sausage, ribs, torpedo. Sides were Mac and cheese and bbq beans. Wife had lean brisket, sausage, Mac & cheese and fried okra. The brisket was good as was the sausage. Pork ribs…meh. Beans and Mac weren’t really hot but tasted so good. Show stealers were the rolls and fried okra. I’d say it’s worth a stop if you’re in the neighborhood. Looks good; what town is this in? Rambo wrote: Looks good; what town is this in? Looks good from here, ribs look dry though. Hope you get to feeling better, brutha! OUCH, Sooner, cronic back pain is the *#T&*)&T# and I can relate on the paranoia of the MRI KUDOS for hanging in there and "git'n her done" Plate don't look that bad, especially after two Valium Hope you get this problem taken care of . It was Jason Boland not Borland and the sides were so-so.........except the rolls and the wifes fried okra which were good. Limey your observation on the ribs is spot on. Thanks y'all - I'd go back if in the neighborhood, just not make a trip just to eat there. I was also told I should have gotten the onion rings so maybe next time. Sooner, next time you have an MRI, tell them you want one of the newer machines that now have open sides on them. I know exactly what you are talking about with the tube type. They are a pain in the tail, and I don't like them either. GRailsback wrote: Sooner, next time you have an MRI, tell them you want one of the newer machines that now have open sides on them. I know exactly what you are talking about with the tube type. They are a pain in the tail, and I don't like them either. I did. Dr said they don’t have a clear enough image. I personally think it’s more about what insurance companies and imaging centers the Drs are in cahoots with…my wife says I need to let that conspiracy theory go but I truly believe it . Don't let that theory go, you are correct. I have been in a significant medical battle since July of last year and they are all in cahoots with each other. And every Dr. wants to do it his own way, even if another one has already imaged the same area within a week. Hope you resolve your back issues sooner. Pains a bummer. A good doc can help. My doc was amazing about 10 years ago when I had pain from scar tissue from 2 ops, lived on panadol etc for months. Doc said he would try something different. A pill made for epilepsy has an other benefit, it tricked the body to give me no pain. My pain was a 9 all the time, now it's about .5 and very manageable. 1 pill a day cured me. Your doc knows best! Thanks y’all. It’s an old HS football injury (helmet to the back) that I was able to keep in check through a chiropractor for nearly 20 years. Finally got to where that didn’t help. Couple years back I had a laminectomy that gave me temporary relief but it’s back with a vengeance. The head guy in the Dr’s I’m seeing this time did Tony Romo and Prince Fielders surgeries (Of course that’s not the doc I get). Ran into Dirk Nowitzki there my first visit so I think I’m in good hands this time…I hope. Yup, I’m going to miss my sleep number. Dr’s office said they hope to get the report Monday. My follow up isn’t until after we get back but they are going to call and go over some of it on the phone with me. Cool, I know I don't have to remind you but "Be sure and Travel Wisely - and don't over do if possible"
Got a bad back (and neck) and a Sleep Number bed myself. Way over-priced, but it does help. One other thing I'd recommend is an inversion table. They really do work (I have one). That time spent partially or completely upside down lets your spine decompress and slip back into place. It's more helpful than my chiropractor, LOL. Best of all, you can find them used on Craigslist and similar sites for far less than retail. People use them for a month or so, feel better, and instead of continuing the therapy, they get rid of inversion table. As for the food... Looks like the flavor was there with all of it, BUT it does look a little on the dry side.